How are we using our iPads and tablet devices? Apple’s CEO, Tim Cook announced at Goldman Sachs that tablets will overtake PC sales by the end of 2012. So what is the current state of the tablet market? Whilst there is no single, complete source of data, it is possible to create an overall picture by cobbling the different bits of information together. In the US, Comscore tell us that nearly 98% of tablet data usage is from the iPad. As with the iPhone, it would seem that users do more of everything than other devices. They are also beginning to overtake desktop usage. 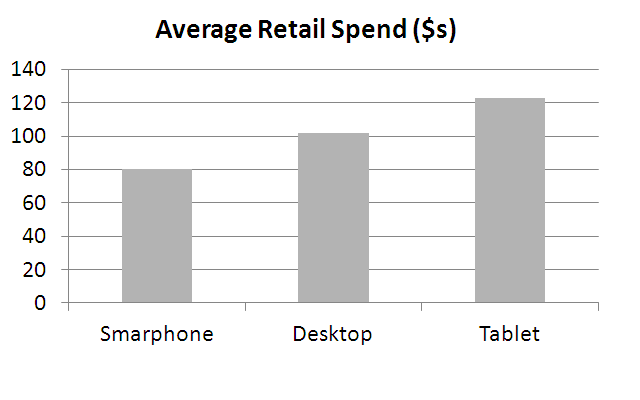 Comscore’s November 2011 figures show that tablets represent 30% of non-desktop traffic. That is considerably higher than the percentage of ownership of ownership. The high sale value is partly down to the ease of use of the devices. In an IAB study in December 2011, nearly half of respondents said they used their tablet because it was ‘the easiest to pick up’ and 37% said that it offered the easiest user interface. But it is also about the user demographic. Tablets tend to be bought by more affluent demographics in the 24-35 age bracket. Given that the tablet is not a PC replacement, but an additional (yet another) device, that is hardly surprising. 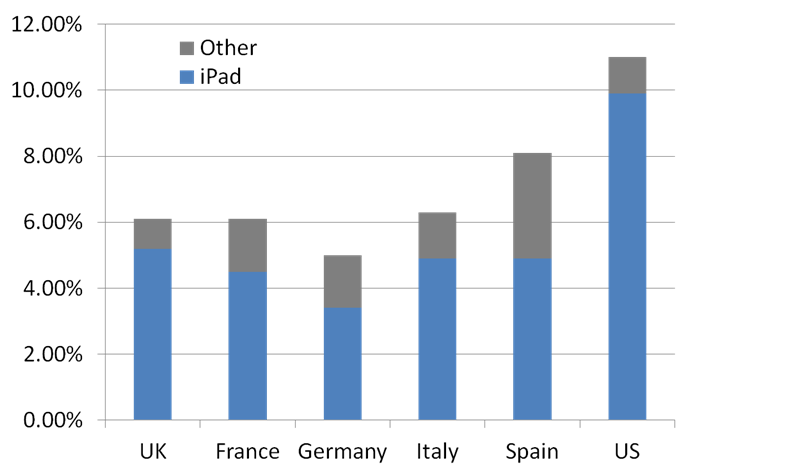 Comscore tell us that in Europe 34% of iPad users also own an iPhone. Data from Nielsen in 2011 found that 70% of tablet owners use it in front of the TV. Clearly, the iPad is the device for two screening. Interestingly though, the iPad is used in bed by nearly 60% of owners and appears to be replacing the book at bedtime. 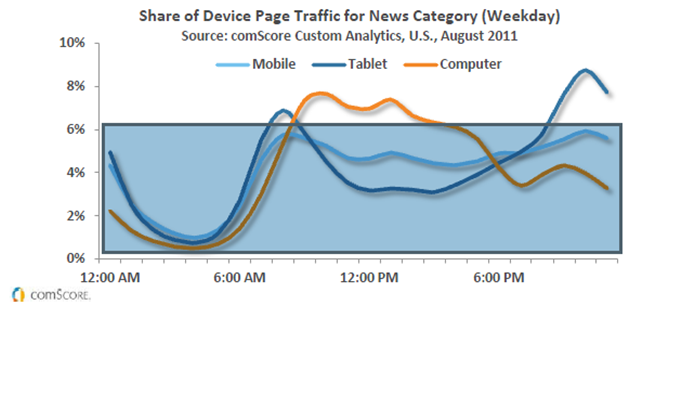 That figure is similar to smartphone use, but with tablets the spike at the end of the day is even more pronounced. Both the IAB study and data from Comscore in the US show that later in the evening, tablets are used more than mobile or television. The lesson for brands is that tablets are different. They are neither mobile nor PC devices. When it comes to engaging users, tablets need their own strategy. It’s more about entertainment, rich media and longer-form reading… last thing at night.